I have been loving seeing everyone's Back to School photos on Instagram and Facebook. People are so creative with their pictures! 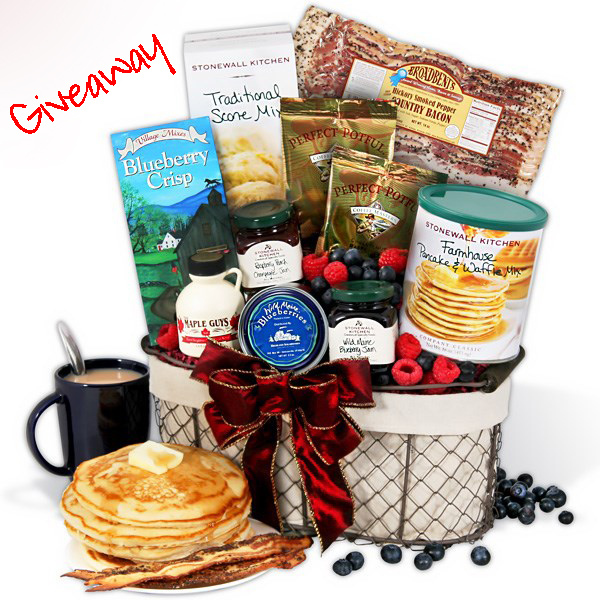 To celebrate Back to School, the nice folks at GourmetGiftBaskets.com want to give 3 lucky Plain Chicken readers this amazing New England Breakfast Gift Basket Deluxe! It is the perfect gift to send to your favorite college student, neices, nephews, and grandkids! · Farmhouse Pancake Mix by Stonewall Kitchen - 16 oz. - A gourmet mix of malted flour and rich vanilla that easily creates fluffy pancakes and light waffles. · Pure New Hampshire Maple Syrup by The Maple Guys - 3.4 oz. - Grade A Dark Amber maple syrup that's won awards for perfect flavor, clarity, and density. · (2) Perfect Potfuls Assorted Gourmet Coffees by Coffee Masters - 1.5 oz. - Rich, gourmet coffee that's already measured out, ensuring pots of perfection. · Wild Maine Blueberries by Highland Sugarworks - 3.5 oz. - Delectable, wild blueberries that are harvested in Maine and packed in water to ensure freshness. · Hickory Smoked Pepper Country Bacon by Broadbent's - 14 oz. - Award-winning bacon that's hand-rubbed with a special blend of pepper and dry cured to perfection. · Wild Maine Blueberry Jam by Stonewall Kitchen - 4 oz. - A rich jam that's expertly crafted from tiny, wild Maine blueberries, the perfect amount of sugar, and a splash of lemon juice. · Blueberry Crisp by Village Mixes - 9 oz. - A delectable mix of the finest, all-natural ingredients that quickly creates a mouthwatering treat with the addition of fresh blueberries and creamy butter. · Traditional Scone Mix by Stonewall Kitchen - 14.37 oz. - A traditional scone mix made from the finest all-natural ingredients. · Raspberry Peach Champagne Jam by Stonewall Kitchen - 4 oz. - A vibrant spread of sweet peaches, tangy raspberries, and refreshing champagne. The giveaway ends on Friday, August 21, 2015 @ 11:59PM CDT. The winners will be contacted via email and has 48 hours to respond. If the winner does not respond within 48 hours, a new winner may be selected. So many goodies in that basket, who could resist? Great giveaway. What a yummy prize basket!!! Looks like some really good products to try! Thanks for the chance to win! You are awesome for sharing!! Good luck to all! I follow you on Instagram, but was not able to open the entry option.